The entire Uruguayan population is holding its collective breath waiting on the fresh news of scans on Edinson Cavani’s left calf as his appearance in the quarterfinal against France will be a game-time decision for Oscar Tabarez. Obviously, the entire course of the game would be different without the PSG striker on the pitch. Allegedly, the man who starred Saturday’s tie with Portugal will be absent for at least a month and it’s really hard to expect him in the starting line-up on Friday afternoon in Nizhniy Novgorod. France are looking for their first ever victory over Uruguay ahead of teams’ seventh H2H outing. Edinson Cavani will likely start from the bench here following an injury he suffered just after netting his second goal of the game against Portugal. Kylian Mbappe stole the show in the R16 tie with Argentina showing the best individual display at the World Cup 2018. 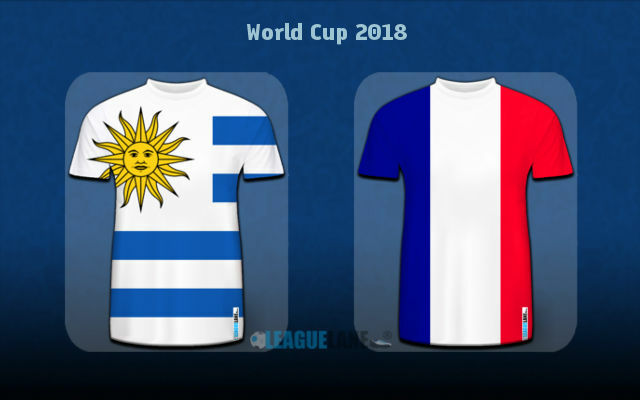 Even with Cavani in squad, Uruguay would have a mountain to climb to go past Les Bleus who have finally shown their true face earlier on Saturday when they survived an Argentina scare in the last 16 round. Even though the French side got off to a dream start to the clash with Los Gauchos when Antoine Griezmann sent Armani wrong way to convert the penalty after an amazing 75-yard run by man of the match Kylian Mbappe. La Albiceleste struck back with the longest range goal scored at the tournament as Angel Di Maria shocked the entire stadium landing home the amazing strike from over 30 yards to bring Argentina back on level terms. When Mercado’s flick ended up behind Hugo Lloris just three minutes after the interval, it seemed Loa Gauchos have gained the momentum, but Stuttgart’s left-back Benjamin Pavard packed an amazing half-volley right into the top right corner to bring France back in the game. It was Pavard’s first ever goal for the national side. We then get back to Kylian Mbappe who stole the show by netting two more goals and take France into safe waters, confirming he has it all to become a world superstar (pace, running, serenity in front of the opponent’s goal, power). PSG forward became the first teenager to hit two or more goals at the World Cup since Michael Owen in 1998 and the first to net on multiple occasions in a single WC affair since Pele against Sweden in 1958. In a perfect scenario Oscar Tabarez will not make any changes to the starting lineup that edged past Portugal to book the place in the quarter final of the World Cup. However, there is bad news for Uruguay fans since Edinson Cavani is set to miss the crucial tie against France following the knock picked up in the round of 16 tie. The South Americans is also facing a scare since Suarez picked up a training injury, but he will still make the starting berth on Friday. 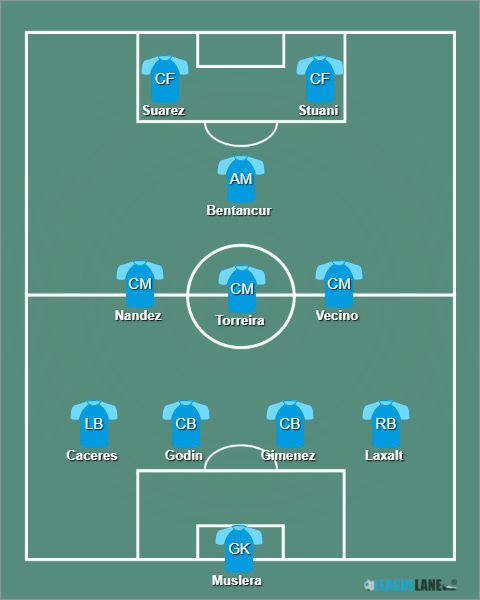 Maxi Gomez or Christian Stuani should feature instead of Cavani as the 4-3-1-2 formation should remain unchanged. Sebastian Coates is likely to miss out as Atletico Madrid center back Jose Maria Gimenez is fully fit to partner his club team mate Diego Godin at the heart of defense. Rodrigo Bentancur is one yellow card away from missing the next match. Didier Deschamps restored the formation he used in the second-round win over Peru for the clash with Argentina. 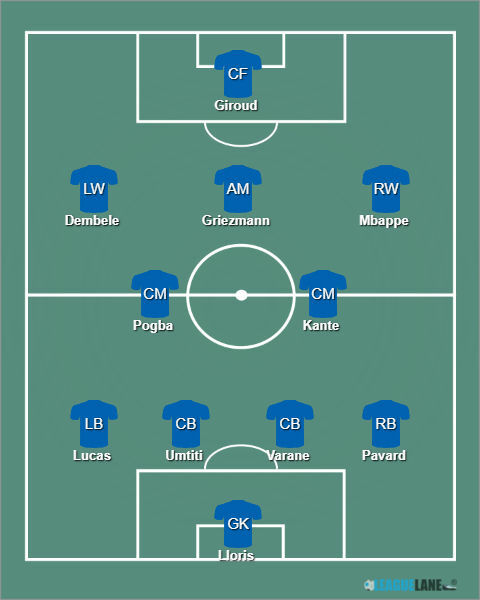 We are thus expecting to see the same starting XI to that clash, meaning Olivier Giroud should still lead the line ahead of the likes of Mbappe and Griezmann. Blaise Matuidi is suspended after accumulation of yellow cards, which means Ousmane Dembele gets another chance here. Paul Pogba, Benjamin Pavard, Olivier Giroud and Corentin Tolisso will miss the semifinals if they pick up a yellow card against Uruguay. France are still looking for their first victory over Uruguay. Can they make it count in seventh attempt on Friday? Draw has been by far the most frequent of outcomes throughout the history, happening on four occasions in six games, Uruguay winning the remaining two. Interestingly, there were no goals in four consecutive head to head contests between the two sides, a streak which came to an end in the previous H2H encounter. It was Uruguay’s narrow 1-0 victory in a friendly in June 2013 when Luis Suarez’s goal made the difference at Estadio Centenario in Montevideo. Group stage matches at World Cups back in 2002 and 2010 both ended in goalless draws. The low-scoring head to head trend could well be continued on Friday given Uruguay’s rock-solid defensive line. Diego Godin and Jose Maria Gimenez make a formidable centre-back pair. They will be up against Atletico Madrid teammate Antoine Griezmann here as it will be interesting to see if the Frenchman knows their weak sides (if there are any). It is once again super important to mention that a lot will depend on Cavani’s potential appearance for Uruguay. Even if he gets on the pitch, the PSG stalwart will likely be far from his 100 per cent. Nevertheless, it will still be anything but a one-way street for France who will be up against one of the best defensive lines at the tournament here. Luis Suarez will still be dangerous up front as Oscar Tabarez has decent substitute strikers in the likes of Maxi Gomez and Christian Stuani, both of whom have had strong seasons for their respective teams in La Liga. To sum it all up, we will go for the value and back Uruguay not to lose at 1.83, following their streak of seven consecutive wins since March this year. La Celeste shipped just one goal so far in the tournament and it came after Portugal’s corner kick in the last 16 round. You can back France to net less than two goals in the match at 1.50. Knowing that only one goal was seen in last five head to head affairs between these two sides, our correct score prediction would be a goalless draw at 6.50. Uruguay or Draw Double Chance @ 1.83. France Under 1.5 Team Goals @ 1.50.